Today, we change pace. I want to introduce you to a beautiful lady with class and style, a one of a kind. She has been imitated, but never copied. I remember her from my days when I lived in San Diego. Many of the guys in my school wanted to go to Tijuana, but I found the Del more alluring. She has known presidents, princes, the elite of Hollywood, and your’s truly. 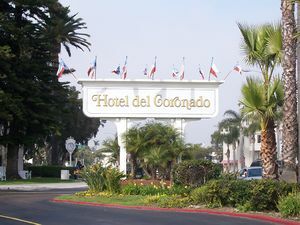 She opened in 1888 as the Hotel del Coronado, but she is known as the Del. 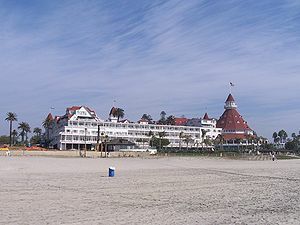 The Hotel del Coronado turns 125 years old this year. The largest and oldest all-wooden building in California, at one time it was on the USA Today’s list of the ten best resorts in the world. In 1880, E.S. 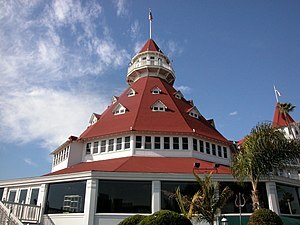 Babcock (a railroad executive), Hampton L. Story (a bank president), and Jacob Gruendike (a founder of a piano company) bought all of Coronado and North islands for $110,000. The architect was James W. Reid of New Brunswick, Canada. The Del certainly does that, and it provides a great view across the bay from the mainland. In 1890, the Spreckel family bought out the partners (which had grown to include two more). The Spreckel family owned the hotel until 1948. 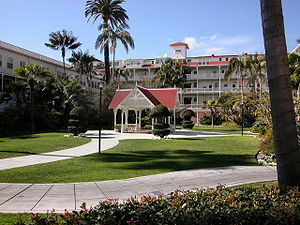 During World War Two pilots who were in training stayed at the Del with their families. The hotel passed through several hands over the years and is currently owned by the Blackstone Group LP, Strategic Hotels & Resorts Inc., and KSL Resorts. The hotel has over one thousand rooms and is valued at over $500 million. Construction started in March 1887. Lumber and labor was a problem at the time, Chinese immigrants were brought down from San Francisco and Oakland. 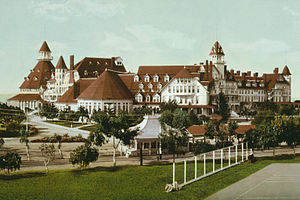 All the lumber from the Dolbeer & Carson Lumber Company was sold on an exclusive contract to build the hotel. The builders also constructed their own brick works, and metal and iron shops on the grounds. Many of the biggest stars in Hollywood from Charlie Chaplin to Brad Pitt have stayed at the Del. Presidents B. Harrison, McKinley, Taft, Wilson, F. Roosevelt, and every president from Eisenhower to Obama have all stayed at the Del. Frank Baum (the Wonderful Wizard of Oz) did much of his writing there, and supposedly Stephen King’s short story 1408 (which was made into a movie) was written about a haunted room at the hotel. 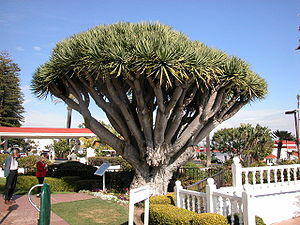 The hotel has also inspired many other short stories, books, and movies. Rooms 3502 and 3312 are supposedly haunted by two young women, both of them were pregnant when they committed suicide at the hotel. The most haunted room is supposed to be room 3327. Other haunted rooms include 3519, 3343, 3284, 3305, 3315 and 3300. Also the lobby, the gift shop, and the hallway on the third floor are supposedly haunted as well. Other ghosts include a Victorian woman who glides across the dance floor, a small boy and girl, other men and women in period clothing, a man dressed in 1940’s style, and some former employees. 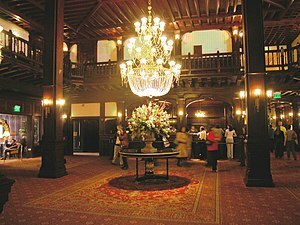 Ghosts aside, the Del is just a great hotel with great atmosphere. Feel like being pampered, or pampering a loved one? The Del is the place to go. 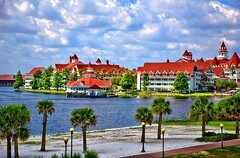 Rates are about the same as a hotel in New York City, and less than Disney’s imitation of the Del, the Grand Floridian. I like the Del, just to get away for a day or two. Walk through her doors and the world just melts away. There is no place like that grand old dame of Southern California. I think everyone should stay there at least once. Oh, and don’t worry about ending up in one of the “haunted” rooms. Ghosts enthusiasts book those rooms solid, well in advance. Lovely post. I am quite enamored with her as well. 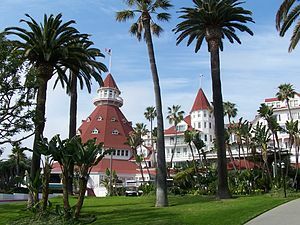 Yes, it is beautiful, had my first marriage honeymoon night there, and also used to take the ferry over and walk all around Coronado. Did the film “Stuntman” there too, a long time ago! I haven’t been there in a long time, tho. Well, maybe it’s time for you and the Captain to take a weekend off. Just had lunch there last week!